Singapore Polytechnic (SP), will be the first institute of higher learning in Singapore to incorporate EC-Council programs into its existing courses; the Part-Time Specialist Diploma (E-Commerce Technology) and the Certificate of Competence in Information Technology (Infocomm Security). EC-Council is a member-based organisation that certifies individuals in various e-business and security skills. It is the owner and developer of the world famous Certified Ethical Hacker course, Computer Hacking Forensics Investigator program, License Penetration Tester program and various other programs offered in over 60 countries around the globe. Students taking the Diploma in Infocomm Security Management (DISM) at SP will also be the first to receive scholarships and awards totaling S$45,000 from EC-Council. The scholarships & awards are made possible with the signing of a Memorandum of Co-operation (MOC) between DMIT and EC-Council last week. Under this MOC, three scholarships valued at $2,500 each will be awarded annually over the next five years to deserving SP students taking the full-time diploma course. In addition, the organisation will also reward a $1,000 graduation award and a $500 EC-Council Circle of Excellence Award to exemplary students during the same period. 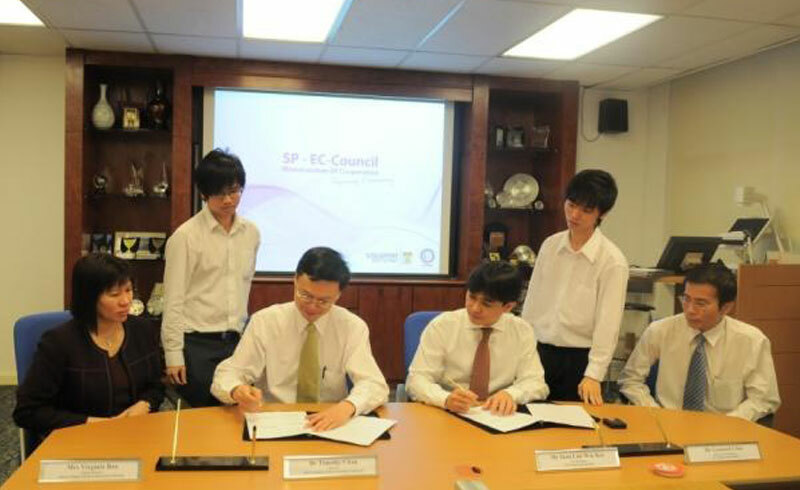 On top of that, SP will be the first polytechnic to offer EC-Council courses to students under the Academia Partner Program. In line with the MOC, SP’s School of DMIT has become an EC-Council Academia Partner and an Accredited Training Centre that will offer EC-Council professional certification training programs. EC-Council will be providing reference materials and publications related to information security, which will be accessible to students at the DMIT’s Infocomm Security Labs. There will also be opportunities for knowledge sharing, staff exchanges and engagements between both parties. Six SP lecturers have successfully completed the world-renowned Certified Ethical Hacker (CEH) program recently and another two final-year students are set to undergo the training as well, making them the first SP lecturers and students to join the global community of certified EC-Council members, currently standing at over 26,000 across more than 60 countries. “In this era of K-economy, EC-Council recognises the need to nurture more information security personnel and experts. There’s no better way to do so than paving the way for a group of deserving students who aspire to be part of the information security community. As such, we are immensely pleased to have Singapore Polytechnic as one of our education partners”, said Mr. Sean Lim, Vice President of EC-Council.